The Jacks ‘R’ Better Bear Mountain Bridge Hammock is a true lay flat, sleep straight hammock. No Suspension – Use a suspension you already have or DIY your own suspension solution. The primary ring, secondary rings, and secondary straps are still in place so just attach your chosen suspension to the primary ring and you are ready to hang. Hammock End Straps and Tri-Glide No knots or lashings are required. As simple to attach the hammock to each tree as fastening a belt. Position the tri-glide buckle on the strap. Wrap the running end around the tree and thread the running end through one side of the tri-glide buckle. Adjust to center the hammock between the trees. Then thread the running end through the second half of the tri-glide buckle. Two 10′ long, 1 inch wide, 700 pound, polypropylene web straps with 1.5 inch loops in one end and two JRB Tri-Glides. Each strap weighs 2.1 oz. Each tri-glide weighs 0.3 oz. Total weight for the set is 4.8 oz. The Jacks ‘R’ Better Bear Mountain Bridge Hammock is a true lay flat, sleep straight hammock. It achieves these notable results by departing from the common “gather end” design to utilize a suspension bridge technique. The hammock takes its name from the suspension bridge over the Hudson River that carries the Appalachian Trail. When the Bear Mountain Bridge was completed in 1924 it was the largest suspension bridge in the world. This is the lowest point of the entire Appalachian Trail at 127 feet above sea level. The JRB Bear Mountain Bridge Hammock is constructed of 70D rip stop nylon material and high strength polypropylene webbing. It will comfortably accommodate individuals up to 6 foot 3 inches tall and up to 250 pounds. 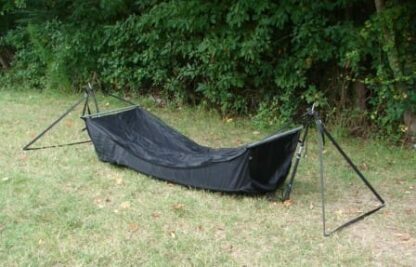 The hammock comes complete with an attached bug net made of no-see-um netting that is zippered on three sides with a double pull zipper. It can be unzipped and tied back if desired when there is no bug threat. There are two personal gear pockets, one on each end wall of the hammock. And for added comfort we’ve included a re-usable, 14″ x 10″, 0.6 ounce, inflatable pillow. For bottom insulation, use the loops on each corner to attach the Mt Washington or Greylock series of under quilts or any of the standard (78″x48″) JRB quilts as an under quilt (attachment instructions); or the built in 26 inch wide pad pocket that will accommodate most camping pads. Hammock End Straps and Tri-Glide Set -Ultra-light hammock suspension set. No knots or lashings are required. As simple to attach the hammock to each tree as fastening a belt. Position the tri-glide buckle on the strap. Wrap the running end around the tree and thread the running end through one side of the tri-glide buckle. Adjust to center the hammock between the trees. Then thread the running end through the second half of the tri-glide buckle. CAUTION: The aluminum spreader bars that come with the Bear Mountain Bridge Hammock are intended to withstand the compression force along their long axis caused by the suspension straps when the hammock is loaded. Lateral stresses on the spreader bars, particularly when they are under compression, will cause the bars to fail and bend, ruining the spreader bars. DO NOT try to adjust your body position in the hammock by pulling on the spreader bars. Instead grab the sides of the hammock to adjust your body position. Jacks ‘R’ Better does not recommend hanging packs or other gear from the spreader bar itself as this places unnecessary stress on the spreader bar. I ordered my husband, a BMBH during the Black Friday sale and he absolutely loves it. He has every brand of hammock that is out and he said that the BMBH is the most comfortable hammock he has ever had and slept in it all weekend. Normally he wakes up every couple of hours in his other hammocks to get comfortable but in the BMBH he sleeps all night long.. I used to switch to change what I was using for shelter almost every other trip. My basement looks like an outdoor shop with all the tents and various hammocks I have. Then I ordered a JRB Bear Mountain Bridge and none of my other tents or hammocks have been used since 2008! 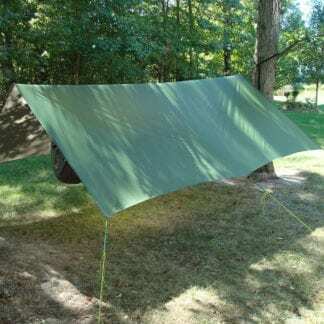 It is a true lay flat hammock that is easy to get comfortable in for sleeping and it is great to sit in while doing camp chores like cooking. This is a great hammock! I’m new to hammock camping but I have read a lot about it and chose this product based on what I’ve read and the recommendation from a friend. 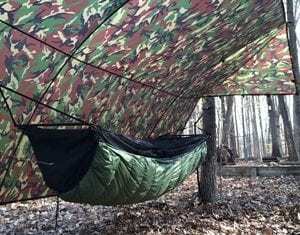 I don’t usually post until I’ve had a lot of experience with the product but I wanted to get this out because of some of the things I’ve read and seen regarding this hammock. Mostly these are coming from You Tube Video’s I’ve seen on modification. I’m not sure why you would void the warranty for so little gain by doing this. I took the hammock out of the box and hung it up in a matter of minutes. It was as simple as it could be. I had no place to hang it in my back yard and I only had a lunch break to do it in. The place I hung it was over a drainage ditch full of water. My wife was waiting with camera to see the awaiting disaster. It took me only minutes to hang and once I had it adjusted I had to try it and I didn’t end up in the ditch. The Tri-Glides were also very easy to adjust. The key to hanging this hammock is to use the advice that Jack Tier gave me, which is included in the written instructions. You do not want more than 9′ 3″ between the rings of the hammock where it attaches to the tree harness. Once you make that adjustment the hammock worked flawlessly. I thought it was very stable and as described lay flat. As mentioned on other posts regarding Jacks R Better, the customer service is awsome. Jack Tier spent a ton of time discussing their products before and after purchase. Also, I placed my order on Thursday and it was delivered on Saturday. I love a company that will speak to its customers and strives to exceed their customer expectations. I’ll post again once I’ve had more experience with the product but for now I couldn’t be happier.